Accomplished jazzman Joseph James Evans passed away on January 17, 2014 at age 97. His autobiography, Follow Your Heart: Moving with the Giants of Jazz, Swing, and Rhythm and Blues (written with Christopher Brooks) was published by University of Illinois Press in 2008. Born on October 7, 1916 in Bonifay, Florida, he grew up in Pensacola where his love of music was fostered. As a young man, he moved to New York City where his professional career began to flourish. 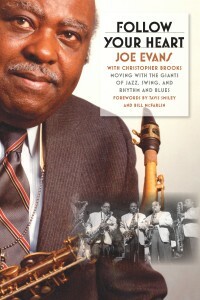 Between 1939 and 1965, “Joe” Evans performed with some of America’s greatest bands and musicians. Throughout the 1940s and 50s Evans played alto and baritone saxophone, flute, and clarinet in Europe and the United States with celebrated bands including Oran “Hot Lips” Page, Sil Austin, Louis Armstrong, Lionel Hampton, Jimmy Lunceford, Cab Calloway, Andy Kirk, Jay McShann, Ivory Joe Hunter, Freddie Mitchell, Johnny Hodges, Don Redman, Thomas “Fats” Waller and many others. Among the musicians with whom he performed include Charlie Parker, John Coltrane, Milt Hinton, and many others. He backed up performers and groups such as LaVerne Baker, Walter Brown, Al Hibbler, the Nat King Cole Trio, Billy Eckstine, Ella Fitzgerald, Billie Holiday, Mahalia Jackson, the Mills Brothers, the Jubilaires, the Platters, the Impressions, Jackie Wilson, “Fats” Domino, Sam Cooke, Dinah Washington, Ruth Brown, Sarah Vaughan, Mary Wells, Joe Williams, Bill “Bojangles” Robinson, and Harry Belafonte. In the early 1960s, he traveled extensively with the Motown Revue backing many of their celebrated performers including Stevie Wonder, the Supremes, Marvin Gaye, the Temptations, Martha and the Vandellas and many others. As a studio musician, he performed on several Motown recordings at Hittsville USA in Detroit. In 1961, Joe Evans formed his own label, Carnival Records. Evans arranged, produced, composed and occasionally played on the label’s recordings. Although the most successful group that Carnival produced was the Manhattans, there were more than thirty affiliate solo artists and groups. After retiring as an active record producer, Evans, a high school dropout, received a GED and enrolled as a student in Essex County College in Newark. He received an associate’s degree in 1973 and then received a Ford Foundation Scholarship to attend graduate school. That fall, he entered Rutgers University and received a Master’s of Education from that institution in 1975. Evans then began working as a dairy inspector for the state of New Jersey. After retiring again, he and his late wife, Anna Moore Evans, moved to Richmond, Virginia.